If your device runs a fairly stock version of Android, there's a good chance you've got DashClock set up front-and-center as a lockscreen widget or somewhere on your home screen. While we receive seemingly endless notifications throughout the day, relatively few applications provide support for DashClock to display that information. This is where DashNotifier comes in. 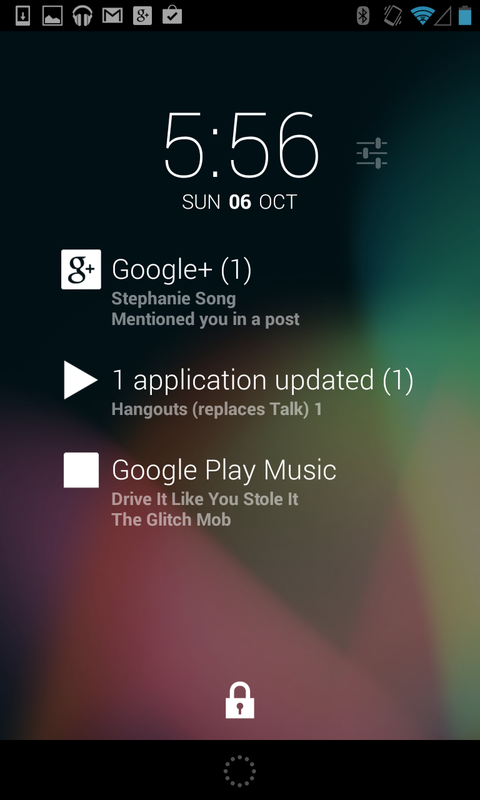 It leverages the NotificationListener service added in Android 4.3 to read and display notifications from selected applications as if they had provided extensions of their own. 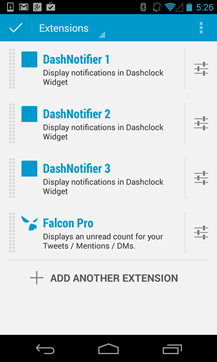 After about a month of development on XDA, DashNotifier is now available on the Google Play Store. 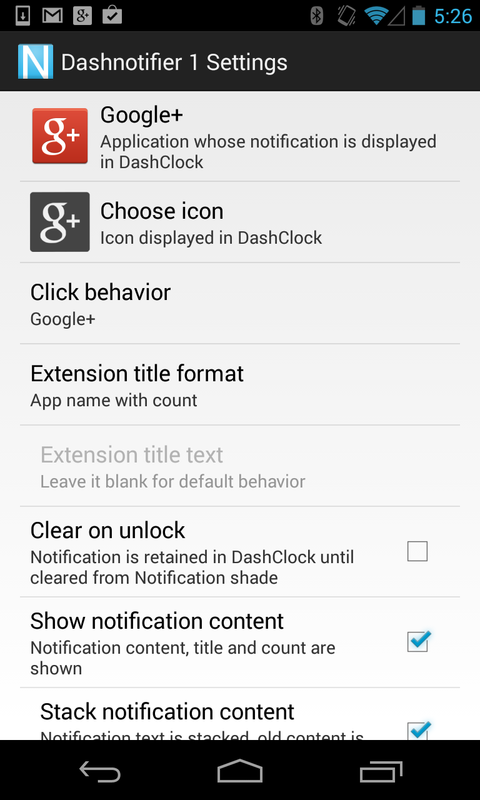 To set up DashNotifier, you just have to add one of the numbered extensions to DashClock, then configure it with the application notifications you wish to see. Each app does require a separate entry in the list of extensions, so this process can become a bit tedious if you are setting up several of these. There are options to control what text is displayed from the notification, the icon, if stacked notifications should be shown or just the latest, and a few other behaviors. You can even direct it to show persistent notifications from apps like Google Play Music or PowerAmp. There are a limited selection of icons provided, but you can also supply your own. DashNotifier isn't the first extension to offer this type of functionality. Back in February, AnyDash launched with a similar set of features but had to rely on the more limited Accessibility service since the NotificationListener did not yet exist at the time. 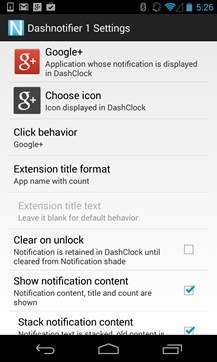 For this reason, DashNotifier can only function on Android 4.3 and above, while AnyDash will still work on devices with 4.2. AnyDash has also added an intermittent reminder to upgrade to the pro version, but DashNotifier is free and open source. It's definitely a great extension and makes notifications from social networks and other apps far more visible and organized. For those interested in helping to test the beta versions, details are available in the development thread to join the Google+ community. 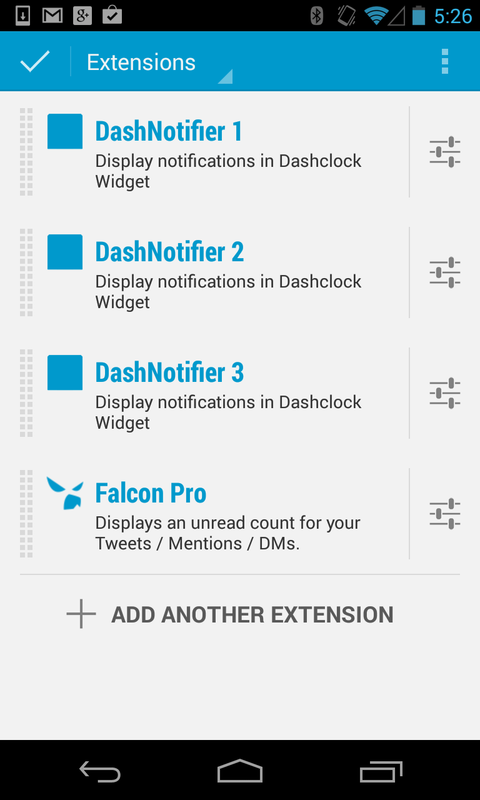 Otherwise, hit the widget below to give DashNotifier a try.